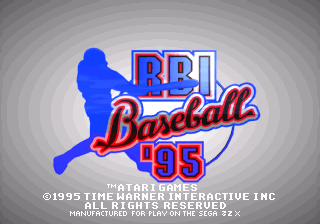 RBI Baseball '95 is a baseball game developed by Atari Games and published by Time Warner Interactive exclusively for the Sega 32X in North America in 1995. It is the last game in the RBI Baseball series to be released on a Sega platform, and follows R.B.I. Baseball '94. RBI Baseball '95's history is curious as it was originally announced at CES 1995 for the Sega Mega-CD as well as the 32X, priced in the US at $49.95 and $54.95 respectively. For some reason the game instead moved onto a cartridge. Main article: RBI Baseball '95/Magazine articles.